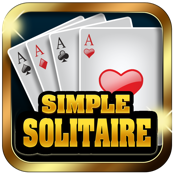 Enjoy the most popular card game ever - 'Simple Solitaire!' (Solitaire in short). . Also known as Patience Klondike or Windows Solitaire. The goal is to place all the cards in each suit in stacks of ascending rank. We have stayed true to the spirit of the classic Solitaire and carefully designed a fresh modern look, woven into the wonderful classic feel that everyone loves. Experience the crisp, clear, and easy to read cards, simple and quick animations, and subtle sounds. Play solitaire to relax and relieve stress. Touch and move cards as you do in real life, cards are flying and landing softly. Clean and vivid graphics make you fully enjoy game play. You can either play the easy 'Draw 1' games where most games are winnable, or if you feel up-to the challenge, try your luck with 'Draw 3' games. Simple Solitaire is the most fun, beautiful, and user-friendly Solitaire you’ve ever played before.